Although it was mentioned that it the programmer could try out examples in this tutorial by entering them line-by-line, this will not actually work when using Tkinter because once the main window starts executing, the interpreter focuses its attention on keeping that window alive and responding until it closes. Creating a Tkinter window only involves seven lines of code. A floating title bar should appear that should be a window. Resize the window in order to get a feeling for what this thing is. The reason that the window shrunk was that there was nothing else in it. The variable named frame serves as a container for other widgets. Although this seems unimportant right now, it will become crucial for anything that is placed into any window widget. The pack function invokes the widget packer for Tk that behaves by putting things in different regions of the frame. This line tells the packer to fill the widget in both width and height, that this widget is permitted to expand, and that the widget should be placed in the top of the main window. Tkinter.Menu causes a menu widget to be created. Issuing the config command on the root window named root adds the menu bar to the window. Creating a hierarchy of menus is not too difficult as seen by how a menu widget is added to a containing widget. In the above example, menuFile is added to menuMainMenu. Pay attention to the setting tearoff=0 because there is a weird (at least to this author) ability for the menu to tear off. Since 0 is false, this ability will be blocked, and there will not be any unexpected behavior. The other line to note is the add_command . Here, the programmer specifies the function callback to operate when the given menu item is selected. Also remember that with Python, any function that is called in the code must be defined linerally before it is called. This will likely not be a problem if OO programming is used because then many functions are defined of the C++ equivalent of the “this” pointer which is named menuMainMenu in Python. Selecting “Exit” should cause the window to disappear and the program to end. Now that the window appears and a menu bar appears, it is time to add the VTK rendering items. Right now, it is more a matter of knowing what to do and not necessarily understanding why. Chapter 3 focuses on VTK, and there is enough information to be able to master the goal of this tutorial. For now, just follow the structure. 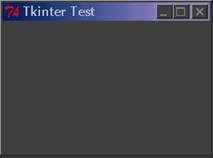 There is a Tkinter widget made specifically for holding VTK objects that appear later in the pipeline like vtkRender and vtkRenderWindow. These two VTK objects will be discussed in greater detail in chapter 3. Now, it is time to learn about vtkTkRenderWindowInteractor. This is the class that has a predefined user interface mapping so that when the user moves the mouse and holds down a button, the objects in the space will rotate about some axis. Another instance is pressing a key on the keyboard and witnessing another effect. This VTK class is a widget that must be packed with the other widgets in the Frame. In order to get a full feel for how this object is used, this new code will be provided and then explained.